Printing temperature: 250-275°C(482-527℉). Melting Point: 250°C(482℉). Packing: net weight 1kg/ print wire rolls, a roll in a box (with a bag with a super thick desiccant, vacuum bag vacuum packaging), each box weight 1.33 kg, inner box gauge 20.5*9*20.5cm 12 box / box, carton gross weight for each case is 43.5X43.5X30CM, 16.5kg. 1,PETG (Polyethylene terephthalate glycol-modified)3D Printer filament is a rigid, tough, high performance material offering excellent clarity, light transmission and high gloss. PETG 3D Printer filament is stronger than PET, and is about as stiff as PLA. 2, PETG meets all the food regulations, such as FDA or BGA, suitable for food packaging applications, oil resistance and good chemical resistance to acid, alkali and oil, etc. are not subject to erosion. 3,PETG 3d Printer filament has high tensile strength, impact resistance and is more durable than PLA. It also has no odour which allows easy printing indoors. It doesn't warp and is recyclable making it better for the environment. A new light plastic. 4, PETG filament has good load capacity printing of ABS and PLA filament, and it's a perfect alternative.Unlike PLA, PETG is highly resistant to temperatures at temperatures above 60 ° C.4. 5,It is ideal for most 3D printers (with print heads that are suitable for 250 °), and can be easily printed on most printing substrates, such as glass, Bluetape, crepe tape and Buildtak. 6.Due to its high layer adhesion and resistance, PETG is optimally suited for manufacturing mechanically stressed components. 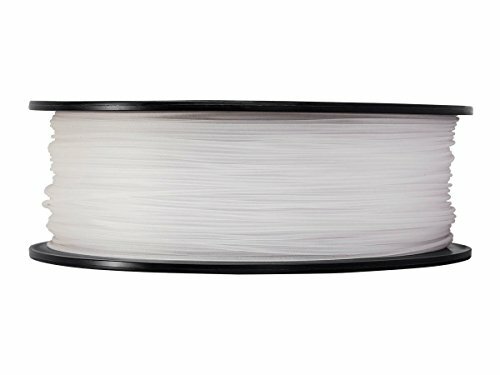 1.75mm Filament Diameter (Dimensional Accuracy +/- 0.05mm).Fast clean pressure, tested to 120mm / s.So that it can only be printed up to about 60mm / s.
1kg/Spool,Vacuumed Sealed With Desiccant inside,then in small box. Recommended Printing Temperature: 250-275°C(482-527℉). Melting Point: 250°C(482℉). If you have any questions about this product by Evergreen Tree, contact us by completing and submitting the form below. If you are looking for a specif part number, please include it with your message.